Yes, the twelve foot inflatable labor rat has returned to my neighborhood. 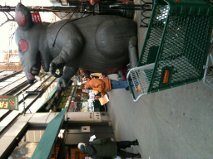 This time “Scabby” (the blog “Mental Floss” says Scabby is the labor rat’s name) visited my local grocery store. Apparently the store was resisting an effort to organize its workers. 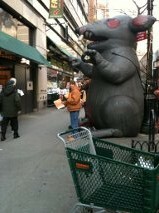 Both sides were clustered under the giant rat, handing out flyers and making their case. The store folks were saying that they already had a union. Later discussions with the employees gave me the impression that they didn’t especially like it. It seems that the current union won’t allow a new employee to join until they have worked for six months. Until an employee joins, she/he doesn’t seem to get overtime (even for working on New Year’s Day?). I didn’t probe for more details, but it struck me again that organized labor is not very organized! Why would one union picket another? Aren’t there plenty of completely un-unionized establishments to work on? Why would a union not welcome anyone into it who wants to join? Does the original union have its own inflatable rat? I read on Scabby’s Wikipedia page that the rat dates from 1991 and is limited to 12 feet in height by local zoning regulations. (Funny to think that inflatable rats are regulated!). Could two unions fighting lead to two rats (maybe different colors?) or a rat and cat combo? (Yes, Wikipedia says there are also inflatable labor cats.) I’ll keep my eyes open and encourage you to do the same. CSRHub provides access to corporate social responsibility and sustainability ratings and information on nearly 6,700 companies from 135 industries in 82 countries. By aggregating and normalizing the information from 200 data sources, CSRHub has created a broad, consistent rating system and a searchable database that links millions of rating elements back to their source. Managers, researchers and activists use CSRHub to benchmark company performance, learn how stakeholders evaluate company CSR practices and seek ways to change the world.